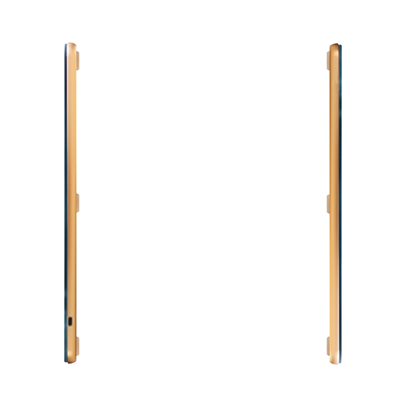 WENSHING UHF RFID Ultra-Thin Tablet All-in-One Reader“WS-Table”series products is the thinnest designation in the world which is only 13mm. LCD display, merchandises information is immediately visible and it is easy to carry. Support Bluetooth 4.2 or WiFi communication. Type-C magnetic adsorption charger interface that enhance users’ convenience. 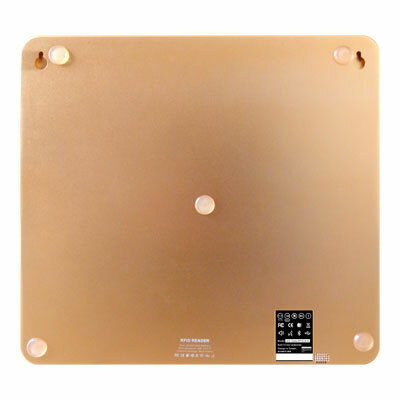 “WS-Table”series products provide alarm function, with sound prompt, voice prompt, or transmit by back-stage system. Exclusive RFID full-color LED strip prompts function. It’s more efficiency and quickly to find merchandise. Transmit power is selectable to set the reading distance. Convenience bracket designation which is able to mount on wall, iron frame or cart. When it combines with mobile applications and users are able to get merchandise details simultaneously. It is powerful and fully achieve the needing of informatization. It is powerful and fully achieve the needing of informatization. 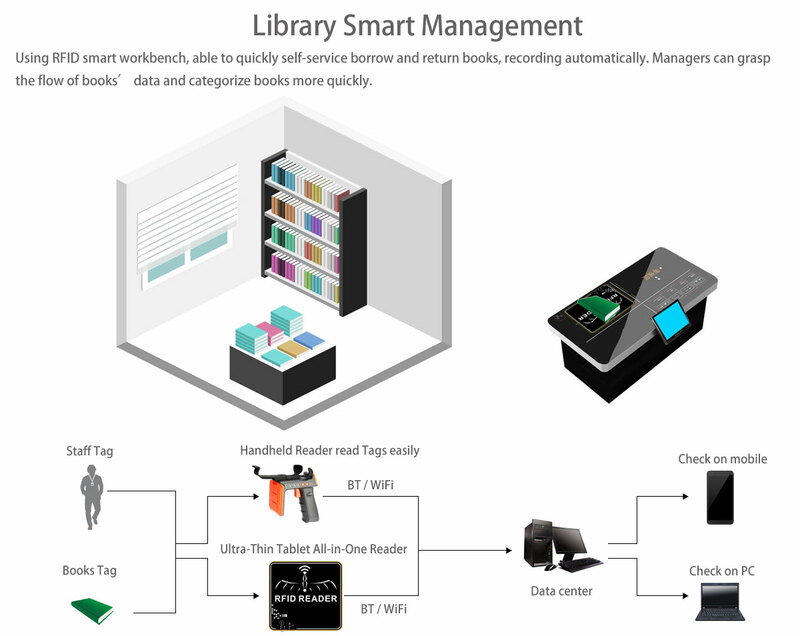 It be widely used on retail-field for quickly checkout, searching items in warehousing, antitheft on access control and stores, quick borrow and return books in library, inventory management, and unmanned store management. LCD display, immediately showing off information of merchandises. Type-C magnetic adsorption charger interface. 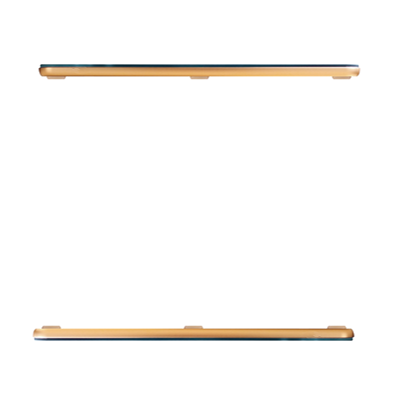 It is the thinnest designation in world which is only 13mm. Exclusive RFID full-color LED strip prompts function. It quickly finds out items. It emits voice prompt when items be stolen, able to select voice or sound prompt or back-end delivery. Transmit power is selectable to set the reading distance. 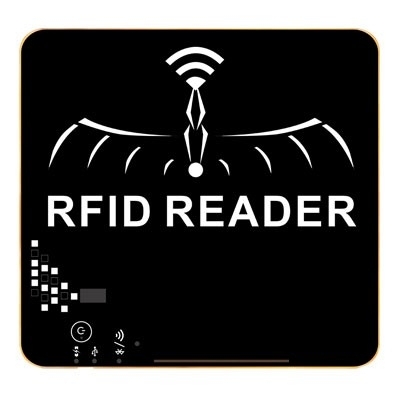 By attaching an RFID Tag to the product, it can be combined with a back-end database. When it combines with mobile applications and users are able to get merchandise details simultaneously. Attached bracket, designation which is able to mount on wall, iron frame, cart etc. 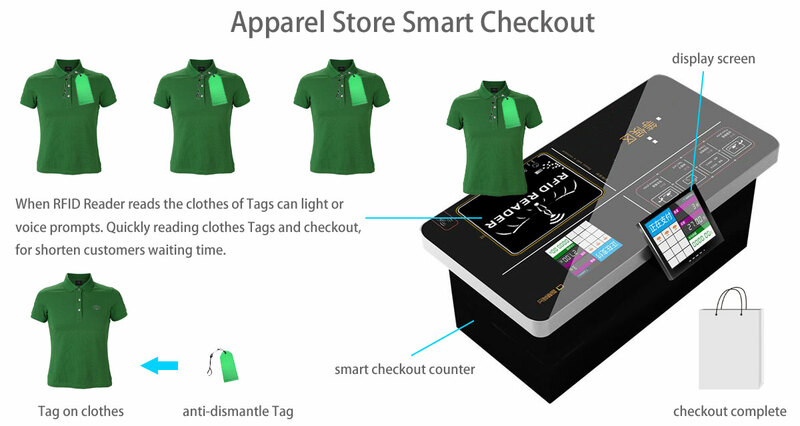 Apparel Management: Product information is immediately displayed, quick checkout, and shorten queuing time. 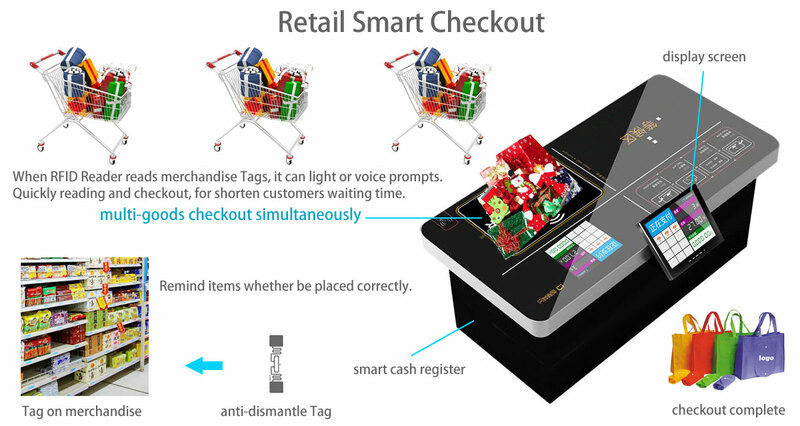 Merchandise Checkout Management: Able to quickly check out large amount of goods. 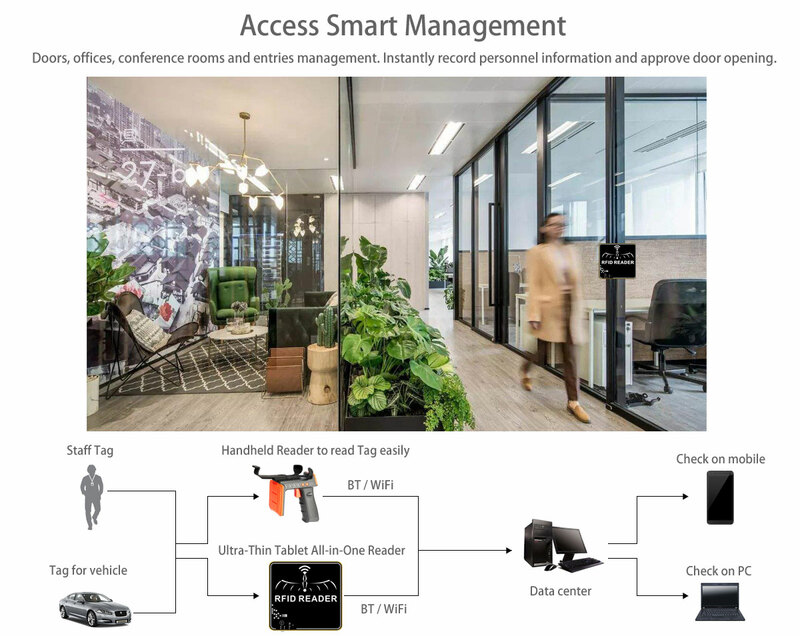 Access Control Management: Can timely see office, conference room, access control and others personnel information. Merchandise Display Management: Remind items and stock whether be placed correctly and enough all the time. 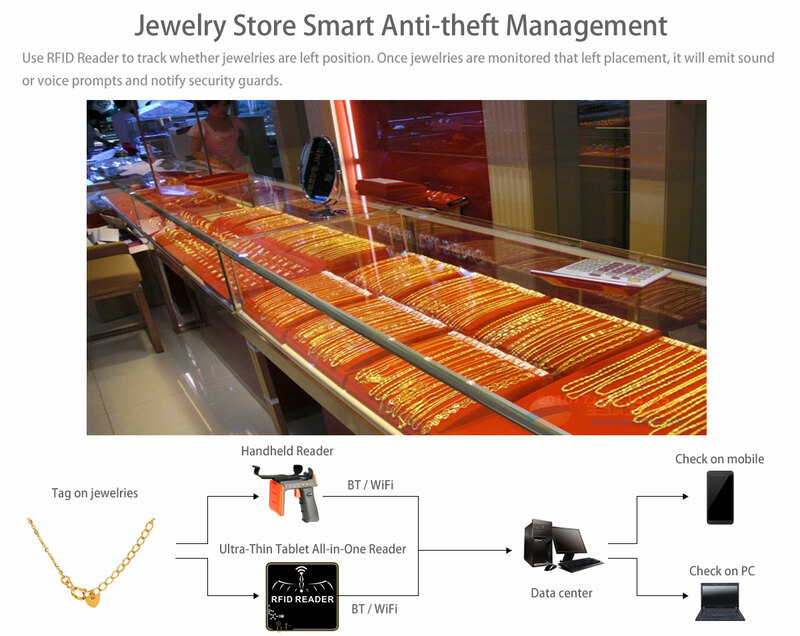 Jewelry Management: Tracking whether jewelries are left position and support voice alarm. Exhibition Venue Management: Entry and exit personnel and item identification management. Books Management: Quick self-service borrowing books to help managers quickly categorize books. Medicine Management: Establish medicine supply management system, and quickly identify medicines. Anti-theft and Anti-counterfeiting：Manage commodity inventory and effectively improve product inventory. Traceability Product：Production information disclosure and consumers feel at ease.